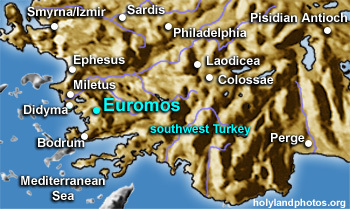 Euromos, also spelled Euromus, is located in southwestern Turkey about 44 mi. [70 km.] southeast of Ephesus — "as the crow flies." The city has not been excavated, but it seems that it flourished from the second century B.C. to the second century A.D. The most prominent remain is the very well preserved Temple of Zeus which may have been constructed during the reign of Hadrian (A.D. 117-138). It is evidently located outside of and north of the city. Note Paul's experience at Lystra where the temple of Zeus was also located "just outside the city" (Acts 14:13). The infrequently visited site is situated in an olive grove just off the main highway. This may be the best preserved of all of the temples in Turkey with 16 of its original columns still standing. For information on the possible relationship of this building with Revelation 3:12 Click Here.